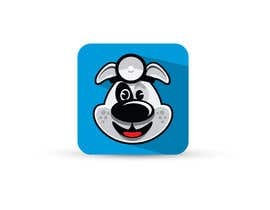 Need a mobile app icon for Spot Dx, a medical mobile app that has a Dog character as the main logo/mascot. We need to design the mobile app icon only. Shadow effect is an example of the after effect i would like, please use the shadow effect to keep the icon modern. OPTIONAL: I attached a pic called Sample instrument because it may be beneficial to add the head lamp instrument as seen in the attached pic to the final design of the icon, however, this is optional at your discretion. I am not sure if it will look great or not, but I believe if you can work it, it will have the edge. I like the style used in Joe-the-dog e.g. vector, shadows, clean, cartoon, crisp, uncluttered. 1. Please do NOT copy Joe-the-dog 100% because we would get sued. 2. You MAY come up with your own version of the dog, OR alter the attached Joe-the-dog very slightly e.g. change the number of dots on the face, or change the number of fur spikes, or change the tail, or the size of the nose, as you see fit. 3.